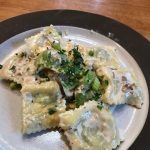 Spinach Goat Cheese Ravioli with Creamy Mushroom Sauce – Damn Life is Good! 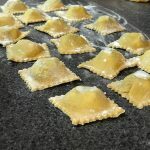 Homemade ravioli is fun and super easy to make. It just takes a bit of effort and a whole lot of washing the countertops. Paul loves making pasta (yay for me!). Our go-to summer time recipe is the goat cheese with a fresh tomato sauce also on this site. But since tomatoes are not in season, we came up with this hearty version that is just as fabulous. We also had some leftover dough so decided to also try a couple Raviolo al Uovo (egg yolk ravioli). They were also spectacular and a real show stopper! 1. On a marble or wooden work surface, pile the flour into a mound. Make a well in the center of the mound that goes all the way down to the work surface. In a small bowl, beat the eggs, salt and olive oil together with a fork until blended, then add them to the well. Continue beating the egg mixture with the fork, gradually working the flour from the sides of the well into the egg mixture. As you work, the egg mixture will become thicker and the size of the well will expand. 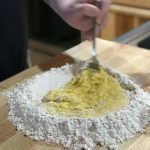 Continue beating until there is just a thin ring of flour around the egg mixture and the dough becomes too thick to mix with a fork before almost all of the flour is incorporated. Drizzle a tiny amount of the warm water over the egg mixture and continue mixing. It is possible you will not need any water at all. Work the remaining flour into the dough with your hands just until a rough, firm dough is formed. Rub your hands together to remove as much dough as possible and add that to the rest of the dough. Shape the dough into a rough ball and set it aside. 2. Sprinkle your hands liberally with flour, rubbing them together to remove any remaining scraps of dough from your skin. With a knife, loosen any dough and flour from the work surface. Pass these scrapings through a sieve so you can reuse the flour and discard the scraps in the sieve. Make sure your hands are clean and flour them lightly. 3. Once you have formed a rough ball, it is ready to knead. Flour a marble or wooden work surface. (For effective kneading by hand, the surface should be hip-high; this will allow you to put your body weight into the kneading motion). Press the heel of one hand deep into the dough, keeping your fingers high. Then press down on the dough while pushing it firmly away from you – the dough will stretch and roll under your hand like a large shell. Turn the dough over, then press into the dough, first the knuckles of one hand, than with the other; do this about ten times with the knuckles of each hand. Use the knuckles of your forefingers especially during this process. Then repeat the stretching and knuckling process, using more flour if needed to prevent sticking, until the dough is smooth and silky, 10 to 20 minutes (every few minutes of kneading, take a break and let the dough rest for a minute or so). Roll the dough into a smooth ball. 4. Place the dough in a small bowl and cover with plastic wrap. Let the dough rest for at least 1 hour at room temperature or up to 1 day in the refrigerator, before rolling and shaping the pasta. If the dough has been refrigerated let it stand at room temperature for at least 1 hour before rolling and shaping. Put oil in pan then add garlic. Sauté for about a minute then add chopped spinach, one handful at a time until all spinach is wilted. Put in medium mixing bowl then add remaining ingredients and mix. Set aside. It’s that easy. Get a large work surface ready. 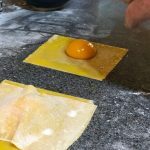 You’ll need a pasta machine (we use an inexpensive crank one that clamps to the counter), a pasta cutter, some flour on hand and several large kitchen towels. 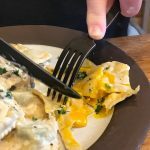 You’ll also need a rolling pin and a ravioli press (trust us – this is the tool to use – here’s and inexpensive one on Amazon). Using your hands, form the pasta dough ball into something that looks like a stubby loaf of French bread. Using the pasta cutter, slice it into six equal pieces. Flour them and press them into a large cookie shape. Set your pasta machine to the widest setting. Run each piece through – then fold it in half and do it again. Notch the machine one smaller and repeat. Put the pasta sheets on a floured section of the counter and cover with a dish towel. Working one at a time, roll each sheet through the next smaller setting. You’ll do this until each dough sheet will cover the entire ravioli press. It’ll be about 4-5 notches. Now, heavily flour the base of the press and lay one sheet over it. Flour the top of the sheet and press in the plastic form to create the dimples. Using a spoon, add a little ball of filling to each dimple. 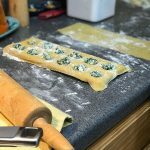 Lay another pasta sheet over the top and then roll, pressing down hard, with the rolling pin. This will seal the ravioli and cut off the extra pasta. Pull of the dough at the edges and tip out the raviolis and put on a covered, floured kitchen town and fold over. Repeat two more times and you’ll have three dozen perfect raviolis. In a frying pan, melt the butter and add the mushrooms and shallots and stir to saute. After a few moments, add the thyme and a little salt and pepper. Once the mushrooms soften and the shallots turn translucent, pull off the heat and add the cognac, stirring to combine. Put back on the heat and add the cream and let it boil and reduce a bit, turning a light caramel color. Reduce the heat and slowly stir in the grated parmesan to create almost an alfredo-like texture. Get some generously salted water to a rolling boil and toss in (gently!) your raviolis. They cook in just about two minutes. When cooked, pull out with a slotted spoon and add to the frying pan of sauce. Gently toss to get the sauce all over the ravioli. Serve on a nice large plate and top with chopped parsley and just a bit of cracked pepper. Pour a glass of wine and high-five yourself – this is going to be awesome!